'To be free is not merely to cast off one's chains, but to live in a way that respects and enhances the freedom of others.' - Nelson Mandela. Visitors walk through the 22 individual exhibition areas, which contain film footage, photographs, text panels and artifacts illustrating the events and human stories behind apartheid. The apartheid museum illustrates the rise and fall of apartheid. A MUST SEE! 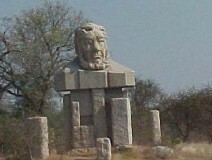 The Cradle of Humankind was declared a world heritage site in 1999. It is a 47000-hectare area in Western Gauteng. It has around 40 different fossil sites, where some of the world's famous fossils have been discovered. We offer a half day tour to any one of the following and a full day tour combining three of the following four attractions: Sterkfontein Caves, Rhino & Lion Park, Wonder Caves and Maropeng Centre. streets, Victorian style buildings, adventurous family rides, gold pouring exhibitions and a visit down a gold mine shaft. A must see attraction for the whole family. In Soweto, southwest of Johannesburg, you will catch a glimpse of the lives of an estimated 3 million residents. This amazing tour includes a visit to the Mandela and Family House Museum, The Hector Peterson Museum . We will take you to a typical shebeen (Tavern) for refreshments and a chat with locals. This tour includes a drive past a taxi rank, a squatter camp, Vista University and Chris Hani Baragwanath Hospital. The Name is Synonymous with Magnificent Scenery and Outstanding Game Viewing. This is a Fantastic Opportunity to see South Africa's "BIG FIVE" Lion, Leopard, Elephant, Rhino, Buffalo, while recently a new member was added, the Hippo, now known as the "BIG SIX". Accommodation ranges from the affordable bungalows to exclusive game lodges. Pretoria is the capital city of South Africa. We visit the Voortrekker Monument, Church Square, Kruger House, the Embassy area and much more. We stop at the Union Buildings, home to the Presidents office, from where you can view this panoramic Jacaranda City.